The “soaps” that most of us use every day to keep our hands clean with are actually called beauty bars, moisturizing bars, or body bars, but not soap. Next time, when you walk down the soap isle make sure to read the labels carefully and you will see that the majority of the products are not soaps. These bars are packed with many chemicals most of which are harmful to our skin, health, and the planet. The reason they are called bars is because they’re actually detergents which are derived from organic acids unlike soaps which are made from fatty acids. On the other hand, handmade natural soaps are not just free of harmful components but they are also nutritional for the skin and a healthy alternative to commercial soaps. In mass produced “soaps” or bars, parabens are used as preservatives to prevent microbial growth and increase shelf life; however, their harm is far greater than their good . For instance, parabens can easily penetrate the skin and negatively affect male and female reproductive organs by interfering with regular hormone function  . This harmful chemical has also been found in breast cancer tissues indicating a relationship between parabens and breast cancer . Moreover, this chemical is capable of increasing skin aging and damaging DNA . Another group of harmful components used in commercial soaps or bars are phthalates which are used to plasticize the product; in other words, they make the product softer and less brittle . However, long term exposure to this chemical can have adverse effects and may cause cancer. Although, there’s not enough scientific evidence to prove the negative effects of phthalates on human health at this time, it is recommended to reduce exposure to this chemical by eliminating commercial soaps from our household cleaning products. Also known as sodium laureth sulfate, this chemical is used as a cleansing and foaming agent in commercial soaps and other cleaning items . This chemical is known to cause skin and eye irritation upon exposure . Moreover, SLS can be contaminated with small amounts of harmful chemicals such as ethylene oxide and 1,4-dioxane depending on the manufacturing process . Ethylene oxide and 1,4-dioxane are known as possible human carcinogens which can have harmful effects on the nervous system and interfere with human development  . Currently, there’s no regulation for the presence of ethylene oxide and 1,4-dioxane as contaminants in Canada . Triclosan is a preservative used as an anti-bacterial agent in mass produced soaps. This chemical can penetrate through the skin, causes skin and eye irritation, and it is believed that it can also cause endocrine disruption  . Although, in Canada, there’s a limited amount that can be used in each product, frequent exposure to triclosan can lead to adverse effects . Moreover, this chemical has been labeled as potentially toxic to aquatic environments as it builds up quickly and degrades at a slow rate . Mass produced soaps obtain their scents from synthetic fragrances which are cheaper and have stronger odor than essential oils . Many of the thousands of chemical used for making artificial fragrances have not been tested for toxicity yet . Synthetic fragrances are predominantly made from petrochemicals – a general term for the thousands of chemicals present in synthetic fragrances – and may contain phthalates and toluene . Toluene is a chemical added to gasoline and is used in the production of benzene . Frequent exposure to Toluene containing synthetic fragrances can lead to central nervous system damage and dysfunction . In addition, synthetic fragrances have also shown to interfere with regular hormonal function which may lead to abnormal cell reproduction and ultimately cancer . By all said, not all fragrance oils are synthetic and have harmful components and some natural fragrance oils are even used in natural handmade soaps because of their strong and pleasant scent. BHA and BHT, p-phenylenediamine, artificial colours listed as “CI” followed by a five digit number, DEA-related ingredients, DMDM hydantoin, diazolidinyl urea, imidazolidinyl urea, methenamine, quarternium-15, PEG compounds, and Petrolatum. These chemicals may cause allergic reactions, skin or/and eye irritation, disruption of the endocrine glands, reproductive organ damage, and even cancer . It is in best interest to avoid these chemicals as much as possible. Notes EWG scientists reviewed Dove Beauty Bar, White for safety according to the methodology outlined in their Skin Deep Cosmetics Database. They assess the ingredients listed on the labels of personal care products based on data in toxicity and regulatory databases, government and health agency assessments and the open scientific literature. EWG’s rating for Dove Beauty Bar, White is 4. Notes EWG scientists reviewed CVS Gold Soap for safety according to the methodology outlined in their Skin Deep Cosmetics Database. They assess the ingredients listed on the labels of personal care products based on data in toxicity and regulatory databases, government and health agency assessments and the open scientific literature. 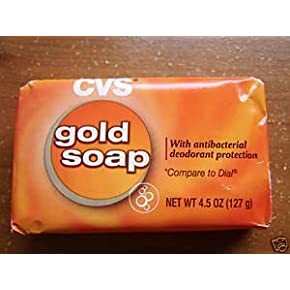 EWG’s rating for CVS Gold Soap is 5. 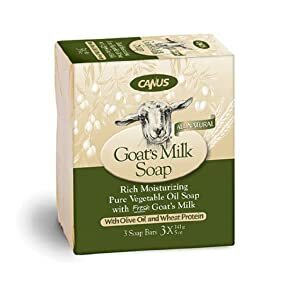 Notes EWG scientists reviewed Canus Goat’s Milk Olive Oil and Wheat Protein Soap (2009 formulation) for safety according to the methodology outlined in their Skin Deep Cosmetics Database. They assess the ingredients listed on the labels of personal care products based on data in toxicity and regulatory databases, government and health agency assessments and the open scientific literature. EWG’s rating for Canus Goat’s Milk Olive Oil and Wheat Protein Soap (2009 formulation) is 5. “Parabens,” U.S. Food and Drug Administration, 24 March 2006. [Online]. Available: http://www.fda.gov/cosmetics/productsingredients/ingredients/ucm128042.htm. [Accessed 23 August 2015]. G. Petersen, D. Rasmussen and K. Gustavson, “Study on enhancing the Endocrine Disrupter priority list with a focus on low production volumes,” DG Environment, 2007. P. Darbre and P. Harvey, “Paraben esters: review of recent studies of endocrine toxicity, absorption, esterase and human exposure, and discussion of potential human health risks.,” Journal of applied toxicology, vol. 28, no. 5, pp. 561-78, 2008. O. Handa, S. Kokura, S. Adachi, T. Takagi, Y. Naito, T. Tanigawa, N. Yoshida and T. Yoshikawa, “Methylparaben potentiates UV-induced damage of skin keratinocytes.,” Toxicology, vol. 227, no. 1-2, 3, pp. 62-72, 2006. “Phthalates,” U.S. Food and Drug Administration, 19 April 2001. [Online]. Available: http://www.fda.gov/Cosmetics/ProductsIngredients/Ingredients/ucm128250.htm. [Accessed 23 August 2015]. “Saftey of Cosmetic Ingredients,” Health Canada, 28 May 2015. [Online]. Available: http://www.hc-sc.gc.ca/cps-spc/cosmet-person/labelling-etiquetage/ingredients-eng.php#a4.13. [Accessed 23 August 2015]. R. Black, F. Hurley and D. harvey, “Occurrence of 1,4-dioxane in cosmetic raw materials and finished cosmetic products,” Journal of AOAC International, vol. 84, no. 3, pp. 666-70, 2001. A. Brashear, F. Unverzagt, M. Farber, J. Bonnin, J. Garcia and E. Grober, “Ethylene oxide neurotoxicity: a cluster of 12 nurses with peripheral and central nervous system toxicity.,” Neurology, vol. 46, no. 4, pp. 992-8, 1996. “CHEMICALS KNOWN TO THE STATE TO CAUSE CANCER OR REPRODUCTIVE TOXICITY,” State of California Environmental Protection Agency, 2014. “Screening Assessment for the Challenge: 1,4-Dioxane,” Government of Canada, March 2010. [Online]. Available: http://www.ec.gc.ca/substances/ese/eng/challenge/batch7/batch7_123-91-1.cfm. [Accessed 23 August 2015]. A. Calafat, X. Ye, L. Wong, J. Reidy and L. Needham, “Urinary concentrations of triclosan in the U.S. population: 2003-2004.,” Journal of Environmental Health Prespectives, vol. 116, no. 3, pp. 303-7, 2008. R. Gee, A. Charles, N. Taylor and P. Darbre, “Oestrogenic and androgenic activity of triclosan in breast cancer cells.,” Journal of Applied Toxicology, vol. 28, no. 1, pp. 78-91, 2008. “Regulation (EC) 1272/2008, Annex VI, Table 3.2,” European Commission, 2009. “ESSENTIAL OILS VS. SYNTHETIC FRAGRANCE,” way out wax, [Online]. Available: http://www.wayoutwax.com/store/pc/viewcontent.asp?idpage=9. [Accessed 23 August 2015]. “Fragrance and parfum,” David Suzuki Foundation, [Online]. Available: http://davidsuzuki.org/issues/health/science/toxics/fragrance-and-parfum/. [Accessed 12 July 2015]. J. P. Koplan, “Toxicology Profile For Toluene,” U.S. Department of Health and Human Services, Atlanta, 2000. “Dirty Dozen’ cosmetic chemicals to avoid,” David Suzuki Foundation, [Online]. Available: http://www.davidsuzuki.org/issues/health/science/toxics/dirty-dozen-cosmetic-chemicals/?gclid=COmf49vE1sYCFZKGfgodt5QOUg. [Accessed 23 August 2015]. “Handmade Natural Soap Vs Mass-Produced Soap,” The Bakewell Soap Company, [Online]. Available: http://www.bakewellsoap.co.uk/handmadevsmassproduced.html. [Accessed 23 August 2015]. “Why All Natural Handcrafted Soap?,” Natural Handcrafted Soap, [Online]. Available: http://www.naturalhandcraftedsoap.com/whyhand.cfm. [Accessed 23 August 2015]. “Dove Beauty Bar, White,” EWG’s Skin Deep, [Online]. 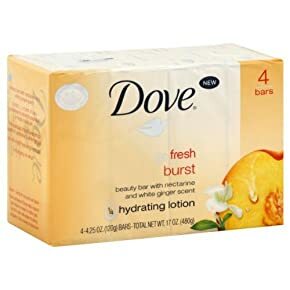 Available: http://www.ewg.org/skindeep/product/476657/Dove_Beauty_Bar%2C_White/. [Accessed 23 August 2015]. “CVS Gold Soap,” EWG’s Skin Deep, [Online]. Available: http://www.ewg.org/skindeep/product/534313/CVS_Gold_Soap/. [Accessed 23 August 2015]. 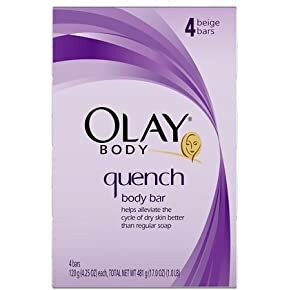 “Olay Body Quench Bath Bars (2009 formulation),” EW’s Skin Deep Cosmetic Database, [Online]. Available: http://www.ewg.org/skindeep/product/211195/Olay_Body_Quench_Bath_Bars_%282009_formulation%29/. [Accessed 23 August 2015]. “Canus Goat’s Milk Olive Oil and Wheat Protein Soap (2009 formulation),” EWG’s Skin Deep, [Online]. Available: http://www.ewg.org/skindeep/product/281645/Canus_Goat%27s_Milk_Olive_Oil_and_Wheat_Protein_Soap_%282009_formulation%29/. [Accessed 23 August 2015].